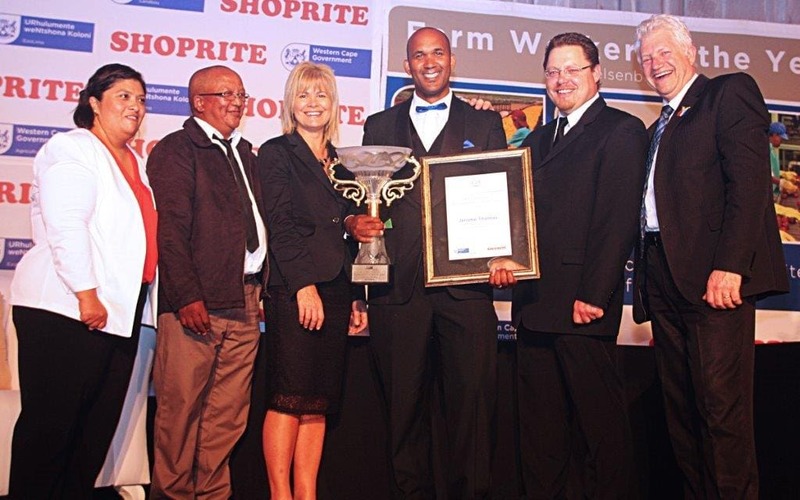 The Western Cape Department of Agriculture (WCDoA) crowned its top Farm Worker of the Year for 2014 during their prestigious event held in Stellenbosch on 7 November 2014. This annual competition for Western Cape farm workers is hosted by the Department in conjunction with Shoprite. The event was attended by high profile dignitaries and approximately 700 farm workers and farmers across the Province. Michael Brinkhuis, Casidra’s CEO, was amongst the guests who attended the event. Prior to the final Farm Worker of the Year competition, Casidra played a significant role during the Regional Farm Worker of the Year competition. “As an official implementing agency for the WCDoA, we ensured that all requests were efficiently and effectively executed. We always strive to deliver the best possible service and ensure that it is successful for our clients”, said Thembi Mlonyeni, Chief Development Officer. Jerome Thomas, a general manager at Kanonkop Wine Estate outside Stellenbosch, walked away with the coveted title of ’Farm Worker of the Year 2014’. According to Thomas, this has been his dream for the past six years and he is extremely grateful for winning the title due to his hard work and perseverance. Thomas received a prize package of R100 000, which included cash, study bursaries and an overseas study tour related to market access. Alan Winde, Minister of Economic Opportunities responsible for Agriculture and Rural Development within the Western Cape, highlighted that agriculture contributes R14.7 billion to the Province’s economy and creates 129 000 jobs. Over and above this, agri-processing brings in R18 billion to the Western Cape economy and creates an additional 79 000 jobs. Winde said, “This is why farm workers play such a critical role”. Minister Winde congratulated all the winners and said, “I am a firm believer of this competition and recognition. As soon as you entered the competition you were a winner and it changed your behaviour. It will be exciting to see you grow and how the difference you make will change the image of the agricultural sector”. He concluded by saying that “Our children need to see agriculture as an important sector and you have become role models and heroes/heroines for them to look up to”. The competition saw a record number of more than a 1000 entries from 15 different regions, which clearly underlines the Western Cape Government’s philosophy of “better together” where government, the private sector and society use opportunities such as these to create a prosperous future for agriculture.